The American Academy of Otolaryngology — Head and Neck Surgery Foundation released an updated evidence-based guideline to improve the diagnosis and treatment of Acute Otitis Externa (AOE) or swimmer's ear. 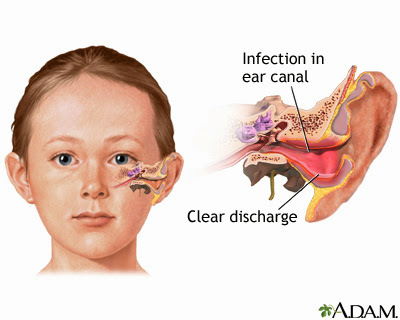 Acute Otitis Externa is an infection of the outer ear caused by bacteria multiplying in the ear canal due to trapped water. It is prevalent during summer and warm climates when increased ear exposure to water is at a high. Aside from bacteria and water, swimmer's ear can also be caused by skin conditions that may contribute to debris in the ear canal, trauma from aggressive ear cleaning, trauma from wearing hearing aids, sweating, allergies, and stress. Symptoms of acute otitis externa are inflammation, itching, a feeling of fullness with or without hearing loss, and pain when tugging on the earlobe or chewing food. Analgesics and eardrops are commonly used to treat the condition. These usually include antiseptics, antibiotics, and corticosteroids. The most effective treatment for AOE is eardrops because of the high local concentration of drug in the ear canal. Oral medication is not as effective because of drug resistance and low concentration achieved in the ear canal compared to a topical method such as eardrops. Avoiding water accumulation and moisture retention in the external ear canal, and maintaining a healthy skin barrier can prevent AOE. The guideline was released to promote the use of analgesics and topical treatments and discourage oral therapy which is deemed ineffective and has adverse effects. The update also includes new and updated clinical trials, systematic reviews, and the participation experts in various fields. With one in every 123 people in the United States affected by Acute Otitis Externa or "swimmer's ear" each year, the American Academy of Otolaryngology—Head and Neck Surgery Foundation released an evidence-based guideline to improve the diagnosis and treatment. The guideline, updated from 2006, was published Monday in the journal Otolaryngology–Head and Neck Surgery. "Swimmer's ear affects nearly 1 in 100 people annually and may cause intense pain. Eardrops offer prompt relief, but about one-third of cases are treated with oral antibiotics, which are ineffective and promote resistant bacteria," says Richard M. Rosenfeld, MD, MPH, chair of the guideline development group. "The updated guideline expands upon prior guidance with new clinical trials, new systematic reviews, and consumer participation, intended to optimize the diagnosis and treatment of this common disorder." The use of topical treatment by antibiotic eardrops rather than oral antibiotics is among the recommendations made. The Foundation included this recommendation in the national Choosing Wisely® campaign, which encourages physicians and patients to talk about treatment options and pursue only those that are necessary and appropriate for an individual patient. The guideline makes eight recommendations in total. The clinical guideline for Acute Otitis Externa was created by a panel that included otolaryngologist—head and neck surgeons, pediatricians, infectious disease physicians, family medicine professionals, dermatologists, and consumer advocates.